Hello there! It is amazing to know you enjoyed my headline enough to click into this post! Did you know that only 20% of people that read a headline will actually read the rest of the a post? Now lets consider a Twitter news feed. The numbers begin to fall even more. As a small business owner, this can become disheartening. You spend so much time crafting a great post only to have 8 out of 10 people read the headline and move on. So what should you do? You should focus more on writing great headlines! We are all guilty of ignoring the headline. We get so wrapped up in writing the paragraphs or finding the most eye catching images that we end up using the first title that comes to mind. The problem with this is that without a good headline, all of the hard work you put into the other aspects of your content will be a waste. After all, isn’t our main goal to get as many views, comments and shares as possible when we create content? In order to be successful as a content marketer, you must build trust with your audience. The best marketers create so much trust that people turn to them any time they need information. You know the best way to lose trust? Click-bait headlines. An example of a click-bait headline is: You Won’t Believe What Happened Next! The problem with these types of headlines is they do not tell a reader anything and their sole purpose is to get as many clicks as possible. What ends up happening most times is readers click into the article excited to see what it is about, only to realize it was a giant waste of their time. Rule of thumb: don’t waste people’s time. Ever. Search engines are the librarians of the internet. When you enter in keywords into Google, it scans the internet for information containing these keywords. 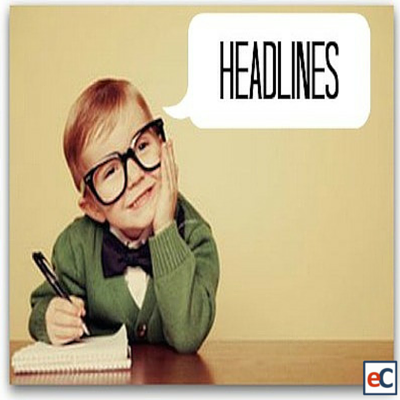 Headlines help search engines to quickly understand what a piece of content is generally about. When you create headlines you want to make sure you include powerful keywords that will help search engines find your content. Be as specific as possible when it comes to optimizing for SEO. If your target market is small businesses, then including “small business” in your headline makes it easier for search engines to show your content to small business minded searchers. A strategy I have found effective is defining a keyword or phrase I want to include in my headline and then building the rest of my headline around it. Writing great headlines takes time. If you really want to take your content to the next level, you need to be willing to spend time on headlines. Spending about 30% of your time on the headline will help prevent your great content from going unnoticed. 1. Set a timer for 10 minutes and write every headline that comes to mind: Even if the headline seem ridiculous, write it down! You can always come up with a better variation once you see your entire list. 5. Don’t overthink it: Great headlines are specific, unique and have a sense of urgency. Stick to these three criteria and you will be well on your way! The average attention span online has now dropped to just eight seconds, one second shorter than the average attention span of a goldfish. Embarrassing, I know. eight seconds certainly isn’t enough time to read your entire post, but it is the perfect amount of time to read a headline. What are some of the creative ways you come up with engaging headlines? Let me know in the comment section.